The fun way to present vital information - offers an even fuller line up this year. See how the NZ Police, St Johns Ambulance & the NZ Fire Service really respond in emergencies, with visual displays & interactive learning for everyone. Watch Police dogs skillfully mastering an obstacle course. Ever thought about a career in these services? Meet local heroes & find out what it takes to be one yourself. DJ Lenny & Michael Alofa plus guests broadcasting from the Visitronic Truck will ensure your day is full of fun activities, challenges & giveaways. Enjoy tasty food & beverages from a variety of food stalls including local schools. Relax with cultural performances & music before you get ready to Salsa & Zumba. Boredom busters aplenty for all: bouncy castles, face painting, competitions & more. Meet local sporting heroes from the NZ Warriors, Northern Mystics & other codes. Join in Sports Waitakere's free 2.4 km fun run. Find out about our local, active community groups & providers - see how you can help them make our neighbourhood a better place. This year the NZ Defence Force will also be putting on a display. 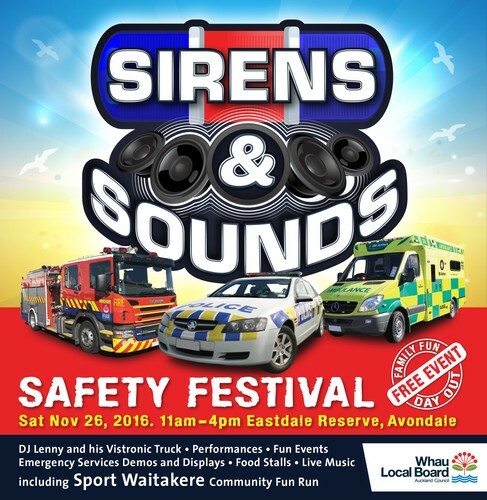 The Sirens & Sounds Emergency Festival is a collaborative effort between the Avondale Neighbourhood Policing Team (NPT), NZ Fire Service & St Johns & is gratefully supported by the Whau Local Board, Rosebank Business Association, Avondale Business Association plus numerous local schools & organisations.